Home > Hints & Tips > Are You a Good Fit for Floristry? Floristry is a wonderfully rewarding career, but it takes a specific set of skills and interests for a florist to truly be a success. Though the idea of working with flowers often appeals to a wide range of people the specifics of floristry may not suit everyone. To help you decide if floristry might be a good career choice we have created the following questionnaire. Simply answer "yes" or "no" to each question and add up your answers to discover if you are a good fit for floristry. 1. Do you have an interest in flowers and plants? 2. Can you withstand working while surrounded by the scents of many different flowers? 3. Do you enjoy working with colours and textures? 4. Do you believe that you have the creativity to make beautiful and unique flower arrangements? 5. Do you enjoy working with the general public? 6. Can you provide good customer service? 7. Are you good at chatting to people to find out what they really want? 8. Do you dream of owning your own business? 9. Are you detail orientated? 10. Are you willing to keep track of orders and fresh stock? 11. Are you confident that you can create attractive and enticing displays? 12. 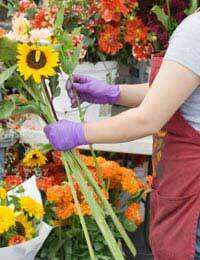 Have you worked in florist shops or with flowers in the past? If you answered "yes" to between one and four questions then you might not be the best fit for floristry. While there are many skills that can be learned in order to be a successful florist, there are also some innate interests that lead most people to floristry. It does not seem as though you have many of these interests. Consider shadowing a working florist or finding work in a flower shop so that you can gain a better understanding of what the day to day work of floristry involves. If you answered "yes" to between five and eight questions then you might be a good fit for floristry. But, analyse your answers to make sure that you have an interest in the flowers themselves because if you don't then you may be suited to be a small business owner but not a florist. Look into local floristry and gardening clubs, make an effort to visit flower shows and fairs and try to immerse yourself in flowers and plants for the next little while. The more excited you become about the idea of a career in floristry the better suited you will probably be to it. If you answered "yes" to nine or more questions then you are a good fit for floristry. You might consider taking a few flower arranging classes just to make sure that you enjoy working directly with flowers, or engaging in floristry and gardening activities with local clubs and societies. If you think you would like to make a career out of floristry then chat with local florists about their training and investigate certification options and/or apprentice schemes in your area. If you are still in secondary education, talk with a careers advisor about how best to plan for a career in floristry.